"We found that it was extraordinary and insubordinate for Comey to conceal his intentions from his superiors." The Justice Department's watchdog said Thursday that former FBI Director James Comey breached protocol and was "insubordinate" but was not politically motivated in his handling of the Hillary Clinton email probe. The long-awaited report from DOJ's inspector general also revealed that Comey used a personal email account to conduct unclassified FBI business, which was "inconsistent" with policy. And it disclosed text messages from two FBI employees that Republicans and the White House are sure to seize on as evidence of FBI bias against President Donald Trump. "[Trump's] not ever going to become president, right? Right?!" FBI lawyer, Lisa Page, wrote to FBI agent Peter Strzok. "No. No he won't. We'll stop it," Strzok responded. "Peter Strzok should no longer be an employee at the FBI,” Rep. Jim Jordan, an Ohio Republican, said after a congressional briefing on the IG's report. White House Press Secretary Sarah Sanders said the report "reaffirmed the President's suspicions about Comey's conduct and the political bias among some of the members of the FBI." Comey's successor as FBI director, Christopher Wray, said the bureau would hold "employees accountable for any misconduct" and announced he had flagged the report's findings to the Office of Professional Responsibility. Wray also said the FBI would train every employee on the lessons of the report, including the use of personal email. The details of Comey's use of personal email elicited a tart comment from Clinton on social media. 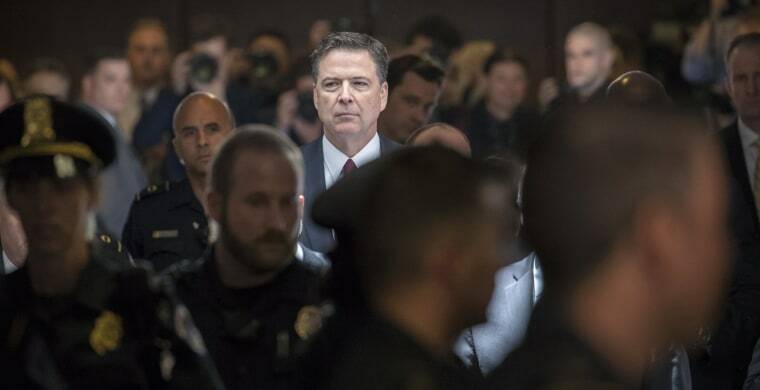 Comey, who was fired by Trump in May 2017, reacted to the IG's report in a tweet and an op-ed for The New York Times. "I do not agree with all of the inspector general’s conclusions, but I respect the work of his office and salute its professionalism," he wrote on Twitter. The IG's report comes three years after the FBI launched its 2015 investigation into Clinton's handling of classified materials while she was Secretary of State, sparked by revelations that she used a private email server instead of her government email address. In January 2017, just before Trump's inauguration, Inspector General Michael Horowitz initiated the review of how the email probe was handled, looking at decisions by FBI and Justice officials — including Comey's surprise decision to speak about it publicly. "While we did not find that these decisions were the result of political bias on Comey’s part, we nevertheless concluded that by departing so clearly and dramatically from FBI and Department norms, the decisions negatively impacted the perception of the FBI and the Department as fair administrators of justice," Horowitz wrote. In July 2016, Comey called a press conference — without the advance knowledge of the Justice Department or the Obama White House — in which he said Clinton had been "extremely careless" in using a private server to classified information but had not done anything criminal. Comey said "no reasonable prosecutor" would bring charges in the case. "We found that it was extraordinary and insubordinate for Comey to conceal his intentions from his superiors, the Attorney General and Deputy Attorney General." Horowitz said of Comey's decision to call the press conference. Then on Oct. 28, just 10 days before the election, Comey notified Congress that he was reopening the investigation because New York FBI agents had found additional emails on the computer of former congressman Anthony Weiner, the husband of Clinton's assistant Huma Abedin, during the course of a separate investigation into Weiner. Horowitz said Comey made a "serious error of judgement" when he decided to notify Congress about the existence of new Clinton emails found on disgraced Congressman Anthony Weiner's computer. The report also says that the FBI had all the information it needed on Sept. 29, 2016, to issue a subpoena to retrieve the emails from Weiner's computer, but acted too slowly. Comey told the inspector general he isn't sure if he knew at the time that Weiner was married to Huma Abedin, Hillary Clinton's aide. Horowitz ruled out political bias in the delay to subpoena the emails in the case of most FBI personnel working on the case, including Comey and his deputy Andrew McCabe. But Horowitz could not rule out whether Strzok was politically motivated, though he points out the decision did not entirely rest on him. The report does not indicate whether any of the subjects of the investigation will be referred for criminal prosecution, but Horowitz did recommend the FBI take administrative action against Strzok, Page and three other unnamed FBI employees. Other messages between Strzok, an agent who worked on both the Clinton email investigation and Special Counsel Robert Mueller's investigation into Trump's campaign, and Lisa Page, an attorney at the bureau, were previously released to Congress and the media. But the new exchange about stopping Trump's election was more damaging. Federal law enforcement personnel are entitled to their own political opinions, but only so far as they do not let it interfere with their investigations of political subjects. "The damage caused by [Strzok and Page's] actions extends far beyond the scope of the [Clinton email] investigation and goes to the heart of the FBI's reputation for neutral fact finding and political independence," Horowitz said in the report. The report did not draw any conclusions about Strzok's conduct when he began participating in the FBI investigation of Russian election interference, which led him to join Special Counsel Robert Mueller's team. The IG is conducting a separate review touching on that investigation, looking into the question of how and why the FBI began surveillance on a Trump aide, Carter Page. Strzok was removed from the Mueller team when Mueller learned about the texts that appeared to show bias against Trump. The report also noted two decisions former Attorney General Loretta Lynch made during the course of the Clinton email investigation. First, she directed the FBI to call the probe a "matter" rather than a criminal investigation. Second, she met with Clinton's husband, former President Bill Clinton, when he climbed aboard her plane on an Arizona tarmac in June 2016. Comey has said the appearance of a cozy relationship between Lynch and the Clintons motivated his decision to independently announce the investigation was closed. Horowitz said Lynch made an "error in judgement" by not ending the conversation with Bill Clinton sooner but found no evidence that they discussed the email investigation. Trump has accused the Justice Department and FBI of being part of a "deep state" conspiracy to help Clinton and hurt his chances of winning the election. He, along with Republicans in Congress, have called for a special counsel to investigate the Justice Department and FBI for political bias and corruption. Republicans said the IG's report only deepens their concern about Justice and underscores the need for a more fulsome probe. "[It is] deeply concerning that you have individuals within the FBI and DOJ that were so intent on taking down President Trump that they even delayed investigations into Hillary Clinton’s email when the laptops from Anthony Weiner were discovered, that they prioritized investigating Donald Trump over following up on real leads that had been provided to them," said Rep. Mark Meadows, R-N.C.
Democrats focused largely on the report’s findings about Comey’s conduct and what they viewed as a "double standard" in talking publicly about the Clinton email probe while never revealing before the election that Trump's own campaign was under scrutiny. They in part faulted Republicans for that, citing relentless attacks on the credibility of the Justice Department. "We understand that the Bureau was under great pressure from Republican Committee Chairmen with subpoena power who spent two years engaged in incessant, cynical, and false attacks about the Clinton investigation itself — but these DOJ and FBI policies exist to help law enforcement officials resist exactly that sort of pressure,” said Reps. Jerrold Nadler, D-N.Y., and Elijah Cummings, D-Md., the top Democrats on the Judiciary and Oversight Committees. Horowitz will testify in public next week in consecutive days before Senate and House committees where he will be pressed to shed additional light on his own investigation.